Donate to COFEPOW instantly - simply click on the button below. If you are joining after August, please choose the month you are joining in below. The full year membership runs from August to the end of July the following year. It is widely known that the Americans entered the Pacific War when the Japanese unexpectedly bombed the US Naval Fleet in Pearl Harbour on 7th December 1941. What is not so well known is that they also attacked Hong Kong later that same day. In a little over two weeks, British and Canadian Forces fought bravely to save the island from falling into Japanese hands. The total Force consisted of 14,000 men from Army, Navy and Air Force personnel together with the Hong Kong Volunteer Defence Corps. However, on Christmas Day 1941 the Japanese overcame the tired and wounded men and Hong Kong was forced to surrender. "We were assured that the demolitions on the mainland had been so extensive that it would take many weeks before the Japanese could bring up their artillery. 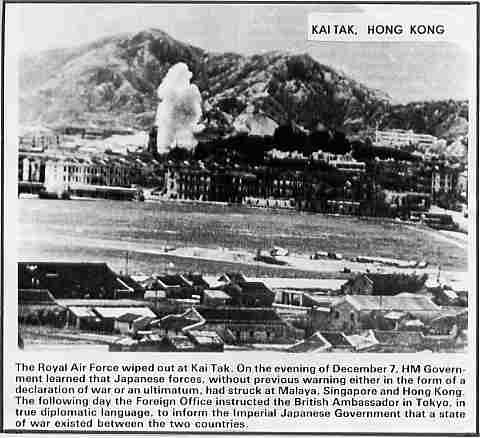 The next day the first heavy shells began exploding on Hong Kong Island." There was a certain amount of tension between the British and the Canadians at the Field Officer level. The British thought the Canadians were a rag-tag bunch of rowdy, cowardly colonists, not good for very much. Much to the consternation of the Canadians, some British historians have written as much. The Canadians thought of the British as arrogant, condescending prigs. They also thought they were wrong to hold fast to the idea that attack would come from the sea. It was at this point, as the mainland troops were returning to Hong Kong on 13th December, that General Maltby took stock of the situation and decided to re-deploy his troops into two Brigades, the East Brigade under Wallis and the West Brigade under Brigadier Lawson. Major Parker says - "A major disadvantage of this new arrangement was that the Canadian Battalions were separated and only one remained under Canadian Brigadier Lawson's command. The Canadians were not very happy with this arrangement but little could be done about it. This seemed unfortunate at the time and was to prove increasingly so during the battle and in post battle repercussions." 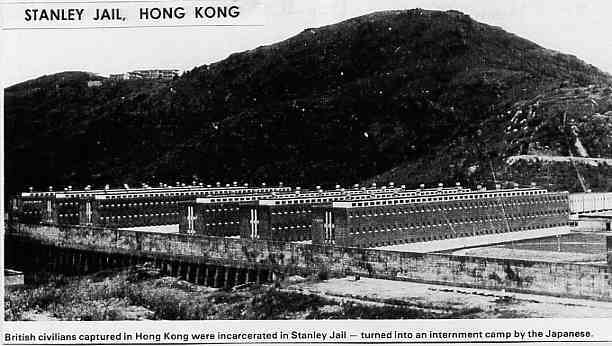 POWs were held captive on Hong Kong for nine long months. Then on 25th September 1942, 1,816 British prisoners were gathered at the Shamshuipo Camp. They were told they were being taken to a better place, a better camp (the same story was told to thousands of men who were to leave Changi Jail, Singapore for Thailand). After the surrender on Christmas Day 1941 those taken captive had not really believed they would be imprisoned for very long and held high hopes for an early release, but after the fall of Singapore, Java and the Philippines they began to fear that an early release was not on the cards. Conditions in the main camp in Shamshuipo and the Officers' Camp in Argyle Street had been extremely unpleasant. There was overcrowding and very little food and water to go round - water being the biggest problem. Medical supplies were scarce. A diphtheria epidemic had reached alarming proportions with such little medicine and was hampered by the lack of sanitary and hygienic conditions. A better place, now being promised, sounded like the answer to their prayers. On 25th September, 1,816 prisoners boarded the 'Lisbon Maru' which was armed and carried Japanese troops as well as Prisoners of War. She was heading for Japan and bore no sign that she was a POW ship. Included in this large number of POWs crammed on board in the three overcrowded holds were members of the Royal Navy, Royal Artillery, 2nd Battalion Royal Scots and 1st Battalion Middlesex Regiment. On the night of 30th September 1942 the 'Lisbon Maru' suffered a torpedo attack by the USS 'Grouper'. She went down by the stern and the 200 men in the aft hold had no chance of escape. The 1,660 or more men in the forward holds got out into the water where the Japanese machine-gunned them. In the early hours of 2nd October she sunk in the China Seas with only 977 eventually being picked up out of 1,816 British prisoners on board. In the months that followed over 2,000 more prisoners left Hong Kong aboard 'rust buckets' that took them to Japan to camps that were often freezing and far from the 'better conditions' that had been promised.